Drupal is a content management system (CMS) designed for building custom websites for personal and business use. Built for high performance and scalability, Drupal provides the necessary tools to create rich, interactive “community” websites with forums, user blogs, and private messaging. Drupal also has support for personal publishing projects and can power podcasts, blogs, and knowledge-based systems, all within a single, unified platform. In addition to the core infrastructure, there are a number of freely available Drupal modules that allow administrators of Drupal sites to provide additional functionality, and a robust API makes it easy to enable these features. Furthermore, Drupal has an advanced theming engine that allows for a great amount of flexibility for displaying content. The Drupal Options section of this guide provides details on all available configuration options for this app. Drupal admin password Password for your Drupal admin profile. Required. Drupal admin username Username for your Drupal admin user. Required. E-Mail for your Drupal account E-Mail address for your Drupal admin user. Required. Your SSH public key Your SSH public key. Advanced Configuration. Domain Domain for your Drupal site. Setting a value in this field will not also enable DNS for your app, which you should do as well. Read our DNS Manager guide for instructions on creating DNS records in the Linode Cloud Manager. Advanced Configuration. Select an Image Debian 9 is currently the only image supported by Drupal One-Click Apps, and it is pre-selected on the Linode creation page. Required. Linode Plan Your Linode’s hardware resources. Drupal is an extremely flexible CMS that can be supported on any size Linode, but we suggest you deploy your Drupal app on a Linode plan that reflects how much content you plan on featuring as well as how much traffic you expect for your site. For small websites, a 1GB Nanode is sufficient. If you decide that you need more or fewer hardware resources after you deploy your app, you can always resize your Linode to a different plan. Required. When you’ve provided all required Linode Options, click on the Create button. Your Drupal app will complete installation anywhere between 2-5 minutes after your Linode has finished provisioning. The IP address will be displayed under the Address column in the IPv4 table. Copy and paste the IPv4 address into a browser window. You should see the Drupal welcome page appear. 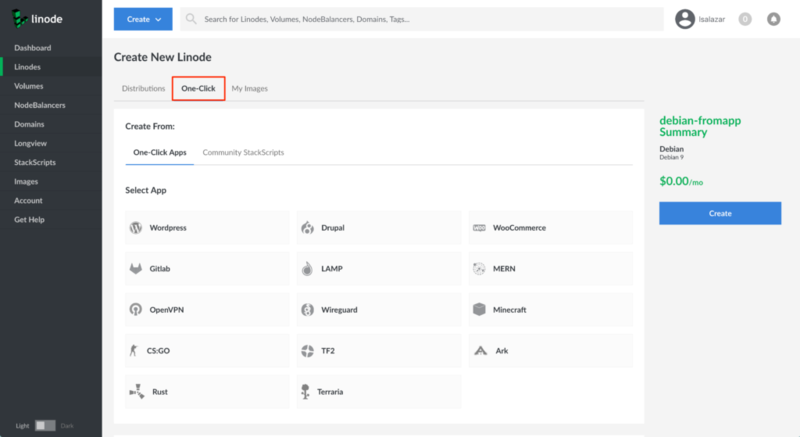 If you deployed your Drupal One-Click App with a domain name and it is pointing to the Linode’s IP address that is hosting your Drupal instance, then you can enter the domain name in a browser window to access your Drupal site. Ensure you are using http://. For more details on registering your domain, see the DNS Manager guide. Once you have accessed your Drupal site via the browser, you can log in using the admin credentials you created when deploying your app. Then, begin configuring your site. PHP 7 Drupal is written in PHP and requires PHP to operate. Apache HTTP Server Web Server used to serve the Drupal site. Drush A command line shell for Drupal. Drupal 8 Content management system.